I know that there have been plenty of HBHM records of late, but this is a special event for me after all the effort! On Friday night I experimented with a 3W UV/LED lamp in a Heath-style trap which usually houses a 125W MV lamp. It attracted a handful of moths , nothing of great interest apart from this one which I believe is Ypsolopha parenthesella. Since this is the most-recorded Ypsolophid on the Carms record sheet I was surprised to find that it was a first for me. However, I have recorded the Honeysuckle moth Y.dentella quite frequently, including on Friday night when it was attracted by the green synergetic lamp of another trap. This trap, no surprise, did rather better than the 3W one in terms of numbers and species, including two more micros, Blastobasis adustella with its characteristic dorsal X-mark, and a Tortricid, probably Acleris hastiana which I've had before, rather than A.cristana which I haven't. Also had parenthesella here the other night. 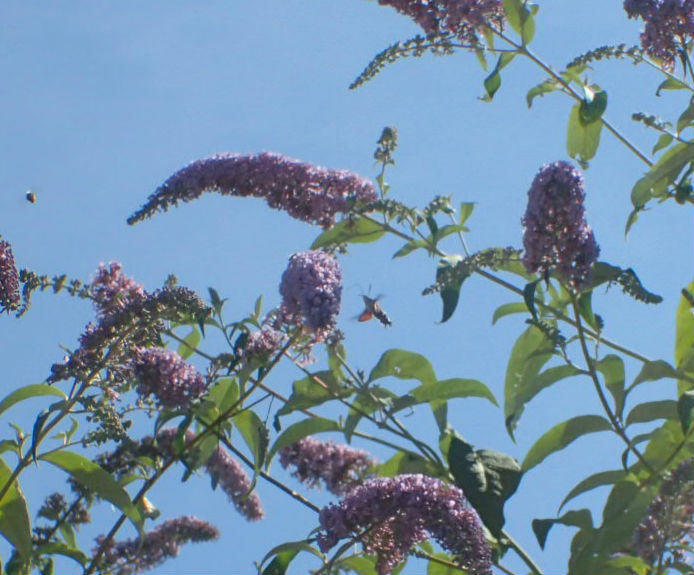 Your buddleias must be magnificent if they are being nurtured. Mine are treated with contempt and they seem to love it. Perhaps 'nurturing' was gilding the lily a bit, Andy. 'Black Knight' took a long time to establish itself and a pretty pink one planted near a fence got chewed by the horses but is recovering, the bog-standard one in the photo spreads itself around liberally. I remember seeing them on the post-war bombed sites in Bristol, growing in the most unlikely places. A very resilient plant!